A few days ago, I was invited to take a session on GTM (Go-To-Market) at a B-school. It was great to go back to a B-school after so many years, and more so to share knowledge and insights based on my experiences. I wondered what I should cover in this session. After much consideration and deliberation, I decided to cover the subject from a practitioner point of view, covering specifically what I wished I had known about GTM before I did the GTM for several platforms / solutions / services. My presentation for the session is here. It was well recieved, and was great to interact and engage with some bright young minds and hear their ideas on the subject. All this feedback is a good catalyst to continue engaging with B-schools ! As basic as it sounds, too many business development professionals who are tasked with lead generation activities don’t prepare enough before a customer meeting. They don’t make a genuine attempt (in terms of time and efforts) in learning about their customer. They assume a lot. They think they know, but in reality they don’t. Individual Profiles – Details on the individuals you are meeting prior to a meeting. A little knowledge on their background, interests and causes they are associated with helps in building a personal rapport when you meet / talk in person. With the power of social media, there is lots one can gather about an individual even before connecting one-o-one. ‘Lead Qualification’ is simply about doing the required due-diligence with the customer / trusted intermediary on whether there exists a business opportunity or not. The most effective lead generation is when you can bring every single “lead” from the “Top of the funnel” (TOFU) moves to the “Middle of the funnel” to the “Bottom of the funnel” (BOFU). And for that, early lead qualification makes all the difference. “Full funnel Optimization” is indeed the dream of most sales professionals, albeit tough to achieve. In my experience, at the ground level – It really all depends on what you are measured on. For e.g. : If you are measured on the number of leads you generate, then the priority would simply on generating maximum leads. If you are measured for % conversion at every stage of the funnel, then you will put in more efforts on ‘lead qualification’ to ensure that the probability of lead conversion is higher. ‘Lead nurturing” is the art and craft of staying connected and engaging in meaningful dialog and interactions with a potential customer. There is a science and skill to it. The below picture says it all! Last but not least, if you don’t track or measure it – the chances of it getting done are lower. So the key is to define a periodic frequeny in which the leads will be reviewed by all key stakeholders. And agree on specific action plan with timelines (if follow-ups are required!). If a lead is out of sight, then it goes out of mind – both your mind and the prospect’s mind! 7 Digital Marketing FAQ’s from Entrepreneurs; Answered! Did you know that in the first quarter of 2015, Indian start-ups have raised $1.7 Bn from investors? Almost every other day a new start-up idea is funded. Click here to check the list of all funding and investments which happened in 2015. The sheer numbers, the ideas and innovations will blow your mind away! Interestingly, as I read through this list, I recognized that they were all pointed solutions to a specific customer need / problem area and as relevant to the Indian market. No dearth of problems, and no dearth of solutions! The big question is who is investing in these ideas? Interestingly, I’ve read news of large Indian companies investing in start-ups. From Wipro which has ear-marked 100 Mn$ invest in start-ups to Infosys which has set aside 250Mn$ for start-up investments to Mr.Ratan Tata who is funding start-ups – It appears that Indian enterprises and business leaders are investing in start-ups. Whether it is purely a financial investment or a business decision to diversify the business portfolio or to be a part of the next big innovation – I can’t say for sure! See, here’s the thing | The Indian start-up community has never been more vibrant – with cool innovative ideas, big dreams, willingness to tread the uncharted waters and a thirst to be part the next BIG thing! I can see flavors of this in my own personal and professional network. The number of entrepreneurs, mom-preneurs, ideapreneurs, intrapraneurs has increased significantly in the last 2-3 years. Since many of them know me personally, and know my experience / expertise in digital marketing – they ask me basic / complex questions. However if I look back – I see that 7 questions have been repeatedly asked by all of them – irrespective of age, business, industry, size / scale of operations. In this post, I am answering those 7 questions for the benefit of any startup based on my experiences. Question 1: Should I have a digital marketing strategy? Answer : This depends completely on your overall marketing objectives, which should be directly linked to business objectives. Once you are convinced that digital marketing is indeed an important element of your overall marketing plan, spend time to understand how digital marketing works. This is the most important step for a fair chance of success. Go for formal (paid) learning programs or enroll for a MOOC (Massive Online Open Course). Attend webinars from experts on the topic. Most importantly, be clear on how you will measure the ROI (Return on Investment) and success of your digital marketing initiatives. Question 2 : What is the boundary between online, digital and social? Online Marketing examples include web-sites, blogs, SEO (Search Engine Optimization), SEM (Search Engine Marketing), online ads, e-mail marketing, blogs, twitter, online Press Release (PR), etc. Offline Marketing examples include print ads, Press Release, Direct Mail, Telemarketing, etc. 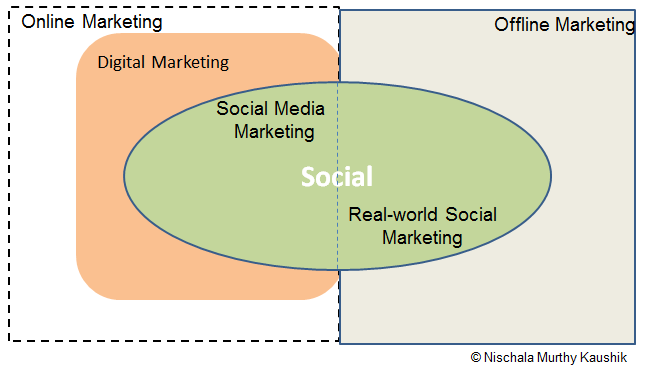 Real-world Social Marketing refers to marketing through ‘real-world’ social interactions and conversations at events, word-of-mouth publicity, etc. Question 3 : Digital / Social Media Marketing – What first and What second? Why? Answer : It depends on your business, and your understanding of social and digital. I know of companies whose digital strategy drove their social media marketing strategies, and I know of companies whose social media strategy drove their digital initiatives. Suffice to say, the digital world and social world are closely coupled and if you do one, you (or / and the ecosystem you’re a part of – like partners, customers, community, suppliers) also make inroads into the other. In most cases, Social Media Marketing is typically a sub-set of Digital Marketing. Question 4 : I hear a lot about ‘Content Marketing’. Should I even go there? First, understand what is content, or more specifically what it ‘digital content’? It includes E-mail, digital notes, Website / Landing page, Presentations, Videos / Infomercials, Blogs, Whitepaper, Flyers, Infographics, Corporate Communication, Tweets, Case Studies / Testimonials, eBook, Books, Survey, Research Reports, Interviews / Q&A (Question and Answers), Press Release (PR), Status Updates (FaceBook, LinkedIn, Google+), Audio content / Podcasts, etc. Content Marketing is leveraging the power of content to achieve whatever marketing objectives you set out with. These objectives can range from Brand Awareness to Lead generation to User / Customer engagement to Sales to Lead Nurturing to Social Advocacy to Professional Networking. If you believe that content marketing can help you achieve your overall marketing objectives, go for it. Else, you might consider putting that time and money into something else. The most important thing to understand about content marketing is that it takes time and focused efforts to yield results, and that it is an evolving journey. As your business grows and evolves, so will your content marketing strategy. If you don’t have a long term commitment and plan, you are better off not doing content marketing. Question 4: Which social channels should I use? FaceBook, Twitter, LinkedIn, Pinterest, ? Answer: The choice of which social channels to use depends completely on your social media objectives and where your customers are. First, define who your customers are and their ‘customer personas’; and use the power of tools and technology to gather data and insights around which social channels they frequent. Don’t do Social because everyone is doing social and because it is the new buzzword. Do it because you believe it will add value to your business and marketing; and enable you to achieve your business objectives. Question 6 : How exactly does Social Media work? Question 7 : Can any marketer do digital marketing? What are the key skills for success in digital marketing? Yes and No. Yes because anyone can learn digital marketing, if you are already a marketing professional it is easier. However, No because assuming that anyone with knowledge / experience in traditional marketing will be able to effectively do ‘digital marketing’ is a myth. Digital Marketing is an evolving and exciting space; and will continue to evolve. Everyone is learning, so be open to learning, failing and course-correction. That is the only way to succeed. A conscious and consistent effort to be clued and glued into the latest and greatest is critical to succeed. Did I miss any question? Leave a comment, and I’ll be sure to respond. Did you know that in the first quarter of 2015, Indian start-ups have raised $1.7 Bn from investors? Almost every other day a new start-up idea is funded. Click here to check the list of all funding and investments which happened in 2015. The sheer numbers, the ideas and innovations will blow your mind away! Interestingly, as I read through this list, I recognized that they were all pointed solutions to a specific customer need / problem area and as relevant to the Indian market. Pretty cool! Several weeks ago I came across another interesting article which highlighted that Top global banks have ear-marked 100Mn$ each to invest in start-ups. The article piqued my interest simply because a bank is in the business of protecting and compounding its own money and the money of its customers. To meet its business objectives, most banks invest in diverse financial instruments to manage their risks and to ensure that they meet their financial obligations. So it seemed interesting when a bank itself was putting its money in a start-up! – not as a loan, but as an investor. That really was an indication of something more significant. Interestingly I’ve also read news of Indian companies investing in start-ups. From Wipro which has ear-marked 100 Mn$ invest in start-ups to Infosys which has set aside 250Mn$ for start-up investments to Mr.Ratan Tata who is funding start-ups – It appears that even Indian IT companies and CXO’s / business leaders are investing in start-ups. Whether it is purely a financial investment or a business decision to diversify the business portfolio or to be a part of the next big innovation – I can’t say for sure! Also not to mention, high net-worth individuals are also funding start-ups. From Bollywood celebrities (like Amitabh Bachchan’s investment in JustDial which grew 10K% times in value to Karisma Kapoor’s investment in BabyOye – there are umpteen examples of Bollywood stars who have invested in new start-ups. It appears that investing in start-ups is soon emerging to be a serious investment option – from banks to corporates to (groups of) individual investors. By simple logic, if you have cash and have already made investments in real-estate, shares, other financial instruments, gold and possibly your own enterprise too, what can you do with any residual cash that you have? Invest in a start-up stands out as a good option – given that India is now a fertile ground for ideas and innovation, and being an entrepreneur is cool! On the other hand, ever since I have been active on LinkedIn over the past few months, I’ve observed a lot individuals in my professional networks have updated their profile to read as “VC [Venture Capitalist] / Mentor to Start-ups”. So two things emerge strongly. One, the start-up industry has never been more vibrant – with ideas, big dreams, willingness to tread the uncharted waters early in life, a quest to be part the next BIG things. Two, everyone is keen to be an investor in start-ups. So even if you don’t have the next big idea or experience or inclination to start your own venture, you can play a part in the start-up community by funding them! After all, money power speaks many languages… Right? So what is the new age mantra for those who have some extra cash? | Invest in a start-up.